Is that by car or in spirit? Chances are, if you meet Cathy Heying, you’ll find both. 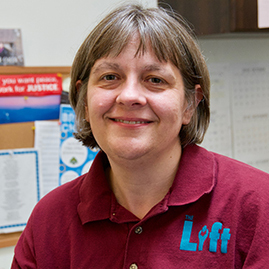 Cathy is the founder and Executive and Operations Director at The Lift Garage, a place where dependable auto repair service is paired with genuine customer service. The Lift Garage is a non-profit offering car repair and inspections at a reduced rate for people with low incomes or experiencing homelessness. Cathy’s early career was in ministry and social work, during which she observed consistent obstacles for people to get out of poverty or homelessness. A common and persistent problem Cathy kept seeing was access to reliable transportation. She noticed a need for affordable car repair to allow people to keep moving forward, both literally and in their goals. She thought that if she were able to gain the skills needed, perhaps she could help people with their car repairs–out of her driveway on the weekends. Though she was terrified, she forged ahead and started her two-year auto technician program at Dunwoody Technical College. Cathy had some minor experience, being able to change the oil on her motorcycle; but at 38, and as a female walking into a classroom with all males who were mostly around age 18, she felt like an odd duck. There were plenty of times when she thought about quitting, but someone would always be there cheering her on. She found a great mentorship through one of her instructors who spent additional time helping her study and providing support. In 2010, Cathy graduated and began laying the ground work for what would become The Lift Garage. She was still working full time, but she knew she had to keep driving forward with her idea if she wanted to be able to “drive the demons out of cars.” She exercised her resourcefulness and met with countless helpers who could provide insight, suggestions, and support to get her idea off the ground. In April of 2013, she opened The Lift Garage with one bay, open one day per week with a budget of $20,000. In five years, it has grown into a garage with 5 bays, open 5 days a week with 10 staff and a budget of $820,000. Throughout the process, Cathy recognizes that nothing happens by one person alone: eeverything we do is done in community. The Lift Garage is not just a place for cars to be fixed. It has been part of Cathy’s mission to bring values of respect and dignity in the way people are treated. Customers are provided solutions and options at a reduced rate without any extra hoops to jump through. She has also been able to offer employment to people who may struggle to find an opportunity to be successful. The garage offers a place where people can find community. . . and a great cup of coffee! Join the TEDxEdina community on Saturday – you may find your own spirits lifted!